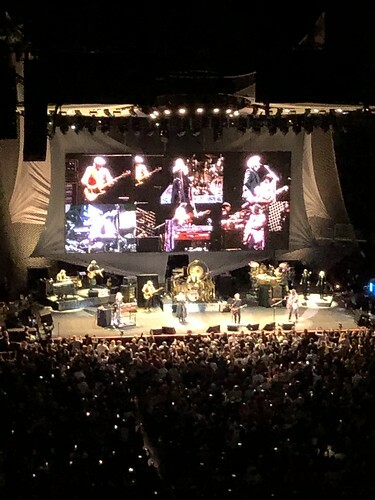 On Friday evening, Mr Pict and I saw Fleetwood Mac live in concert. The tickets were my Christmas present so I had been excited for months to see them perform. I have been a Fleetwood Mac fan for almost as long as I can remember so I have been listening to them for four decades. Whenever I sit at my art table and listen to music while I create, I always play the ‘Rumours’ album, probably my favourite album of all time. I never imagined I would ever have the opportunity to see them perform live so I was flabbergasted when I received the tickets. Mr Pict is not a Fleetwood Mac fan but he does love seeing live music so he was more than happy to accompany me. Friday was also my first time in the Wells Fargo Center. We were in the cheap seats so I experienced a wee bit of vertigo when I saw how steeply raked the seating was and there was also not much in the way of leg room. I am 5’3.5″ but even my knees were feeling the ache when I stood up after two hours. The compact seating meant we also had to get along well with the random strangers seated next to us since we all had no choice but to move and dance in unison given we were all compressed together. 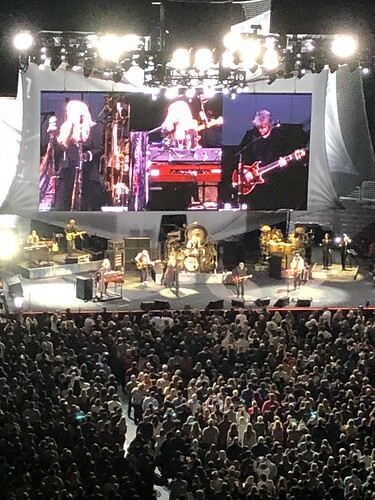 But this minor discomfort was absolutely worth it for the amazing experience of seeing Fleetwood Mac. They played most of their “greatest hits”, including all but three of the tracks from the original ‘Rumours’ track-listing. As such, the crowd was able to cheer within a matter of a couple of notes, recognising what song was about to be performed. It was really quite something to be one of thousands of people all singing along at the same time. I admit to feeling a wee bit emotional during a couple of my favourite songs because I had never imagined I would ever see them performed live. The whole concert was fantastic, extremely polished, incredibly engaging. My voice was strained by the end of the two hours from singing along continuously. It really was an amazing concert and I feel very lucky indeed to have been able to experience it. PS Excuse the poor quality of the photographs. My phone doesn’t do well at all in poor lighting. 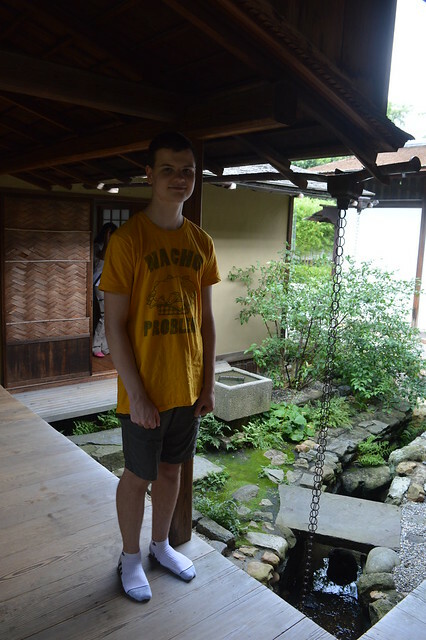 Our Labour Day weekend trip – our last hurrah of Summer break – was to the Shofuso Japanese Cultural Center. 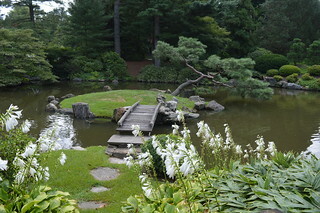 It’s this little portion of Japan in the midst of Philadelphia. 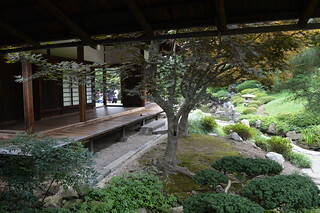 It is also authentically Japanese as the buildings were built in Nagoya, using traditional materials and techniques, and were then transported to America. 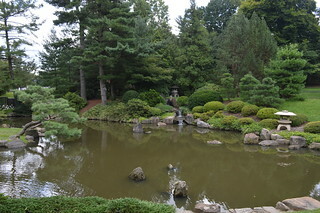 I read that even the rocks in the garden were imported from Japan. Originally, it was part of an exhibition in New York before being disassembled and reconstructed in Philadelphia. It has been in Philly since the late 1950s. We started our visit with the house. We slipped off our shoes and entered the house in our socks. 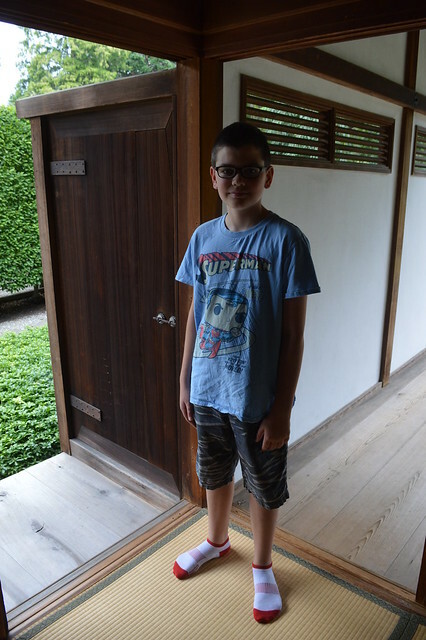 It was everything you think about when you think about traditional Japanese architecture: elevated off the ground, connections between the interior and the exterior, between the man-made and the natural, verandas, lots of wood, sliding doors, and gently curved roofs. There is something inherently relaxing about being in those spaces but I know myself well enough to know I could never actually live in such a space. I am far too fond of objects to be capable of minimalism and maintaining clean lines. And my pelvis is too wrecked to cope with floor sitting. But I like to imagine I could live in such a space. 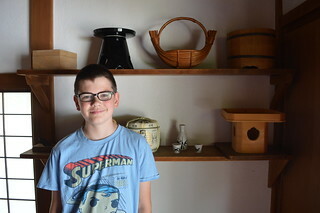 I especially loved the kitchen. I feel like you learn a lot about a culture by looking at kitchens (and supermarkets actually) because so much of culture revolves around food. My kids had zero patience for me reading the information about each room of the house but I insisted on reading all the detail about the kitchen. It was pretty fascinating stuff. 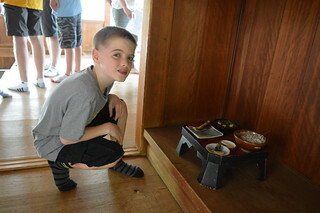 I thought the little tea house would be the most intriguing and engaging part of the house but for me it was actually the kitchen. 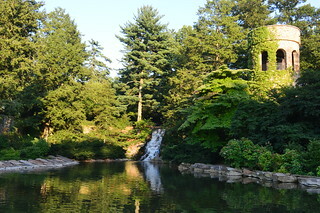 The garden surrounding the house was similarly gorgeous. 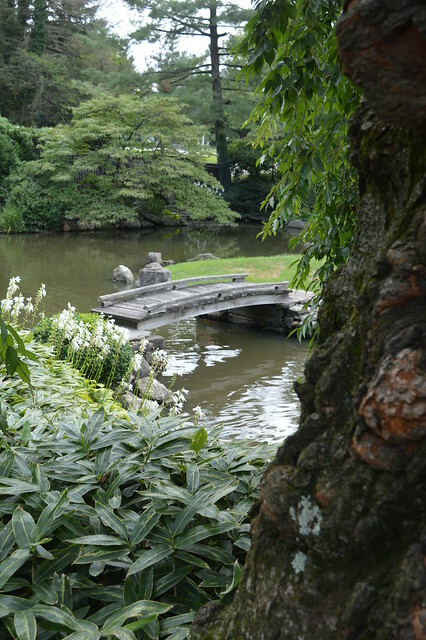 It is such an obvious and probably uninteresting thing to state but it was so green and so harmonious. 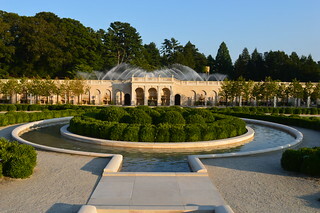 Apparently the landscaping was designed to echo 17th Century styles. 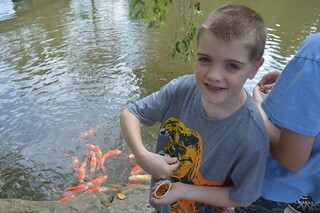 The boys absolutely loved the pond which was stocked with carp. 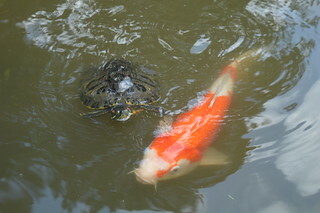 They had some fish food and, within seconds of throwing the first pellet into the water, there was a scrum of koi torpedoing towards them. There was a line of them wiggling through the water from the bridge and making a beeline to the area where my kids were waiting to feed them. 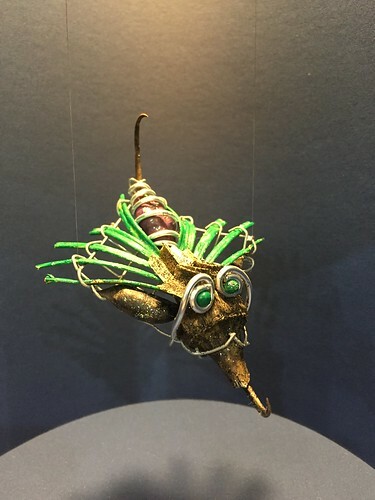 Their dorsal fins cut through the surface of the water and created wakes. I couldn’t help but hum the soundtrack from ‘Jaws’. 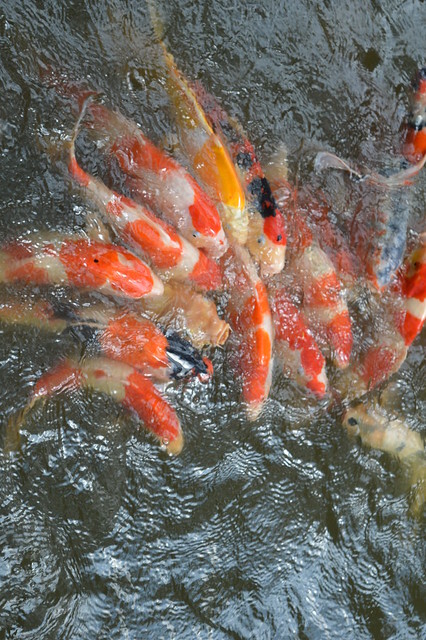 Despite the fact these carp must surely get so fed up of eating the same pellets all the time, there was a serious feeding frenzy. This is such a cliche that I initially resisted typing it out but the whole space really was so peaceful. I could have chilled there for ages. A good book and a glass of cold lemonade and it would have been so easy to just sit there for hours enjoying the garden. But I had four kids with me who had run out of patience and wanted to get home to do their own thing for the final days of Summer so no chance of zen for me. 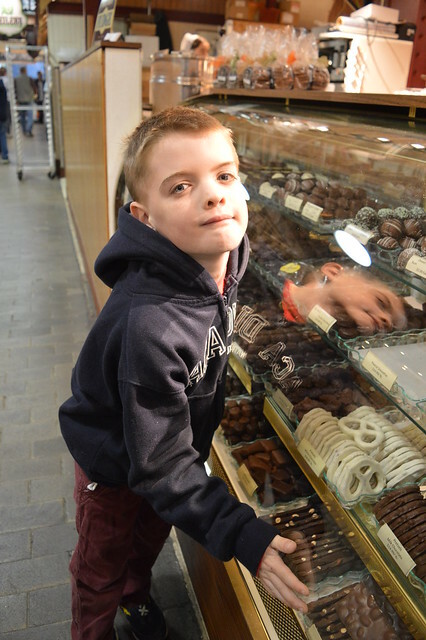 It was our 22nd Wedding Anniversary last week and – as our children happened to be gallivanting with their grandparent for a few days – we could celebrate the occasion as a couple. Unfortunately, I was still recovering from my oral surgery – a complication having caused me two weeks of excruciating and ceaseless neuralgic pain – which slightly put the damper on things and certainly reduced my ability to enjoy a meal out on the actual day. However, eight days into my recovery, I felt well enough to venture out for the evening. 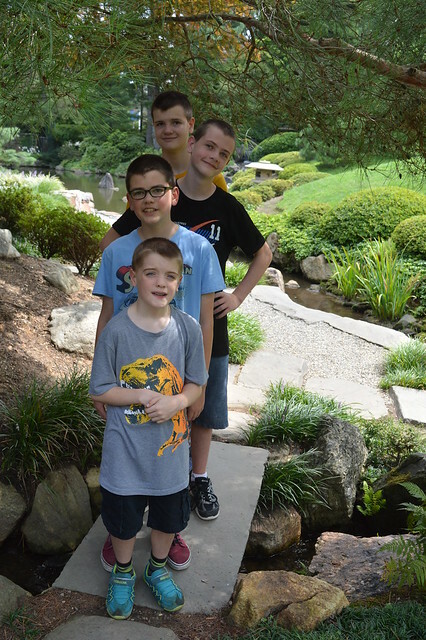 We opted for a visit to Longwood Gardens, having never been before and knowing that our children might not have the required patience for a visit to formal gardens. 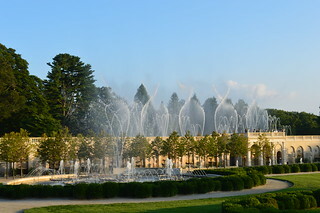 Longwood Gardens developed from a site that had been farmed and turned into an arboretum in the 18th Century. 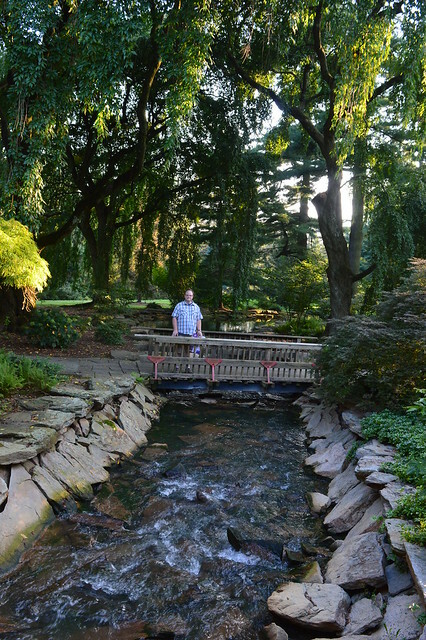 When, at the dawn of the 20th Century, the trees of the arboretum were at risk from being chopped down for lumber, the super-wealthy businessman Pierre du Pont stepped in to save the trees by purchasing the entire property. 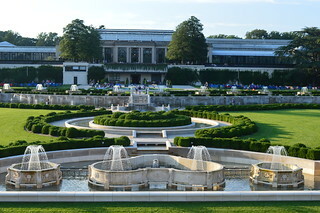 The site then developed into the formal gardens that exist today. It is spread across over a thousand acres so there is a massive amount to see – too much for us as it turned out. 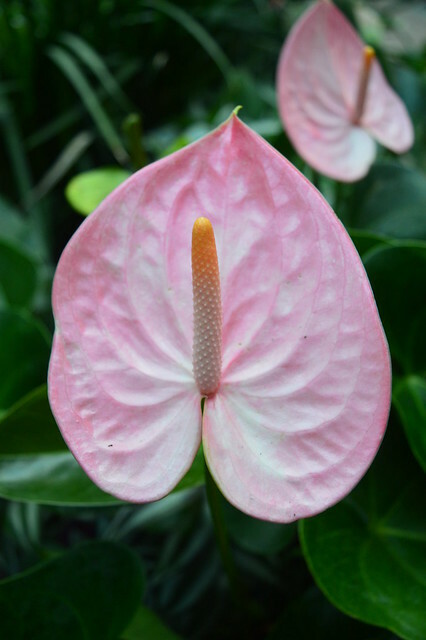 I am not much of a gardener at all and my knowledge of flowers, plants and trees is pretty limited. 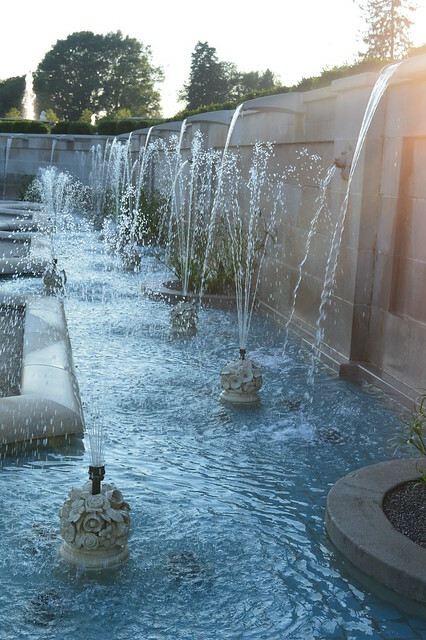 However, I can appreciate the aesthetic qualities of plants and I certainly like garden features, such as fountains and sculptures. I, therefore, thoroughly enjoyed wandering along the pathways at Longwood and seeing what vistas and colours opened up before me. Visiting in the evening not only meant we were spared the worst of the day’s baking heat and gross humidity but were also bathed in a golden light as the sun started to slip lower. We stopped to watch the fountains in action as music played. It was all very pleasing and relaxing. 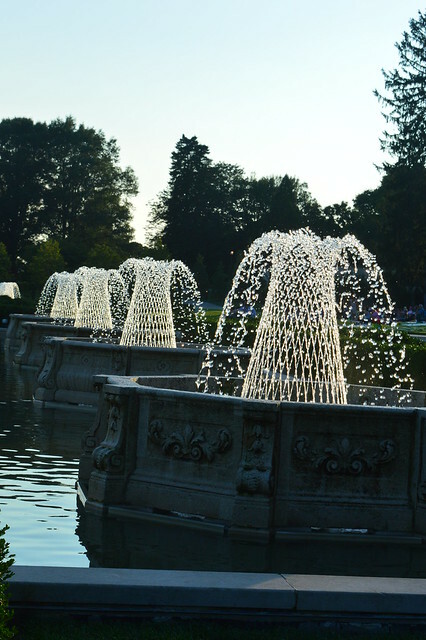 We had visited the pump room and were amazed by all the power involved in working the fountains but, as we watched water shoot up into the sky and dance and spray from so many fountains at once, we understood why that power was required. 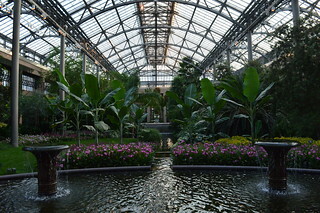 Apparently Longwood’s main conservatory is one of the world’s largest greenhouses. I would certainly estimate it to be the largest I have ever visited. It was arranged into a series of spaces that each focused on a theme. 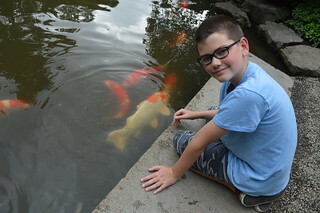 Although we had no kids with us, Mr Pict and I wandered around the children’s indoor garden and found it to be charming. 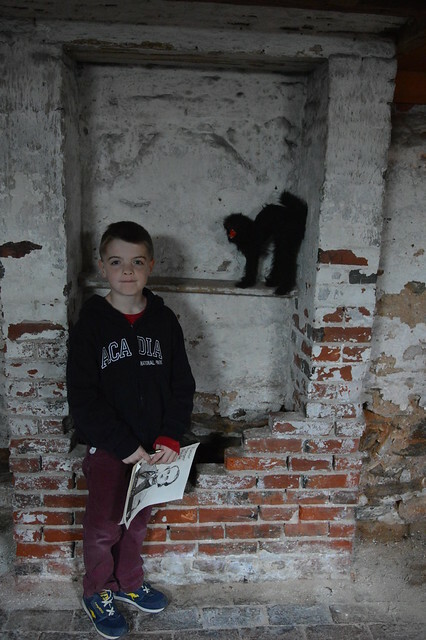 Younger visitors seemed to be delighted by all of the wonderful details and fun little nooks and crannies. 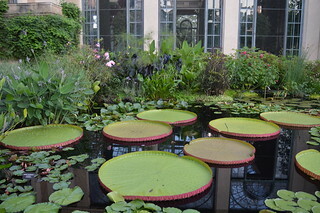 We explored the main conservatory – including the ballroom and organ – and also enjoyed the other conservatories and the lily pond, complete with giant lily pads, between them. I loved the gallery of orchids and Mr Pict loved all the banana plants. The whole place was supremely polished and thoughtful in its detailing. It was a feast for the eyes and the nose. We realised too late that we should have saved the conservatories for last since they had interior lighting while the exterior gardens had, during our time indoors, been plunged into darkness. We still had a good wander in the dark. There was actually something pretty magical about being at the Italian gardens and seeing all the fireflies glowing as they flew up from the grass and into the air. 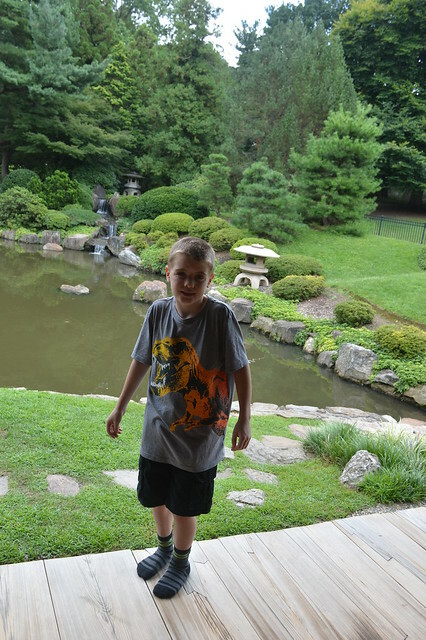 We also saw bats swooping down to chomp on the insects that were hovering above the ponds. Some areas, however, were just too dark to permit any exploration so we had to abandon those. 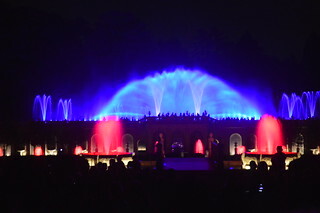 However, an advantage of having found ourselves in Longwood Gardens in the pitch darkness was that we could watch the performance of water, lighting, and music back at the main fountains. The theme of the show happened to be “movies” which was completely perfect for Mr Pict and me since we are such movie nerds. The whole show was amazingly accomplished and very impressive. We thoroughly enjoyed it. Unfortunately, my pain meds had completely worn off about halfway through the show and I was so close to passing out from the pain that I had to sit on the gravel behind rows of standing spectators so missed the last quarter of the event. 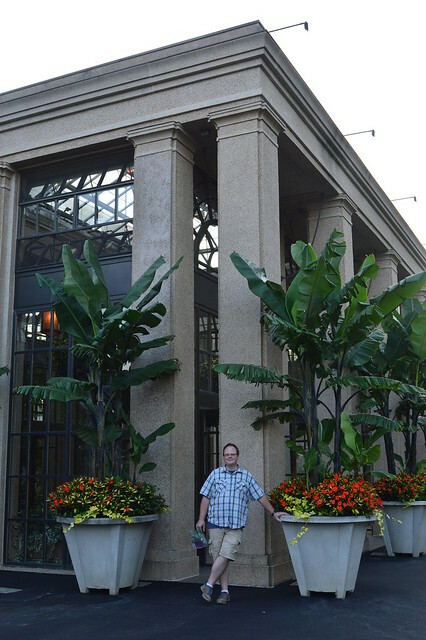 Mr Pict and I both agreed that we would love to return to Longwood Gardens some time, maybe another summer trip to take in the things we missed, maybe during one of their festivals, maybe in a different season to see it in a different context. We might even take the kids some time. I emigrated from Scotland to America as a Green Card holder in October 2013. My husband has been a dual US/UK national since his birth and our children became dual nationals when they became resident in America, made official by them obtaining US passports in October 2015. I, therefore, have been the only alien in the Pict family for quite some time now. My original plan had been, for many and varied reasons, to wait to apply for citizenship until closer to the time when my 10 year Green Card would expire. However, the 2016 presidential election was tough on my psyche and it didn’t get any easier to live in this country without having the ability to vote in 2017. I have always exercised my right to vote so being entirely disenfranchised and unable to participate in the democratic process was really challenging. That, therefore, became the primary reason why I decided to bring forward my timeline for becoming an American citizen. The immigration process was complex and expensive. 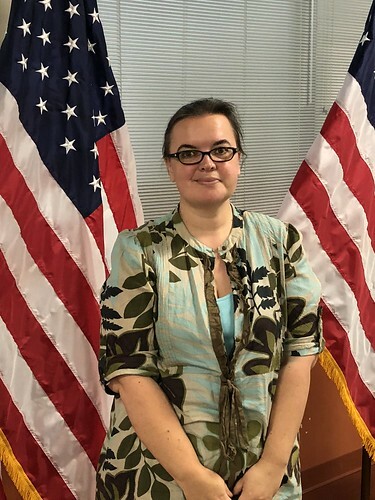 The naturalization process was not quite as challenging and not quite as expensive but it still involved a whole load of tricky bureaucracy and a massive chunk of money. It also involved a large investment of time and a fair dollop of stress. The first stage was to submit my application, which was time consuming and sometimes had me raking through the dusty, musty corners of my memory banks, but nowhere near as complex as the immigration application had been. This was then sent off to Chicago to be picked over and start the ball rolling. However, no sooner had my application arrived in Chicago (I was tracking it) than I received a letter informing me that I was to report to a USCIS field office to have my biometrics taken. No problem except that I had just one day’s notice between receiving the appointment card and the date of the appointment. One day. I flew into instant panic. My husband was working in New York so I had to organise childcare backup for if I had any sort of delay outside school hours – however unlikely – and I had to scramble to find someone to take my place at work. That fits neatly into a single sentence but it involved a whole lot of stress. On the day of my appointment, I dropped off my youngest kids at school and drove off into northern Philly. Thank goodness for Google maps because I had zero clue where I was going. I did, however, meet almost every red light and had to stop at a rail crossing while an exceedingly lengthy cargo train rumbled past so I arrived at the USCIS field office with a mere five minutes to spare. When I walked into the building, it was like a wasteland. There was one other client visible and then everyone else was an employee. The whole appointment, therefore, went smoothly and rapidly and ultimately felt like a giant waste of my time. I had already had biometrics taken (eye scans and fingerprints) when I emigrated and I have had my fingerprints taking subsequently for volunteering and employment purposes. The appointment, therefore, felt like replication. The staff were friendly and courteous and worked efficiently so in no time at all I had been processed and sent on my way with a study guide for the tests. It is unbearably stressful to be in any sort of limbo situation. We had been through this before with the Immigration process. While we had to move forward with our lives as if we were relocating to America, the fact that at any stage either the immigration process might have had a hiccup or the employment prospects for my husband have fallen through, we would have had to abandon the whole plan and root ourselves back into our lives in Scotland. However, that always felt as if it had forward momentum. The Naturalization process felt like suffocating in stasis. After the Biometrics appointment, I had zero contact from USCIS for months. In many ways, that was a positive sign. They did not need to request further information from me which meant my application was sound and, of course, they would have contacted me had they decided to outright reject my application. However, to receive no correspondence for months, no update, no indication that progress was happening, however slowly, was painful. It was also stressful because I could not commit to anything and had to opt out of certain plans because I had no idea when I might be called for Interview (and then the oath taking) but I was pretty sure it would be at short notice when it did happen. Granted I am prone to stress and anxiety but it really was a pretty intense period of waiting. I started to log into my USCIS online account at least once a week to see if there were any updates on my case. In doing so, I discovered that I could monitor the progress of the Philadelphia field office through all the N-400 applications they were handling. Whereas it used to take a few months from submitting an application to being called for interview, they were estimating at least a year. I heard from other sources that this backlog is happening all over the US due to understaffed USCIS offices having to handle a massive increase in applications prompted by the political climate. While not altogether surprising, therefore, it was a bit deflating. It was estimated that I would be called for interview in the Autumn of 2018 which was not just a long time away but would also prevent me from registering to vote in time for the midterm elections. I continued to obsessively check my USCIS account and track the field office and there was never any change. 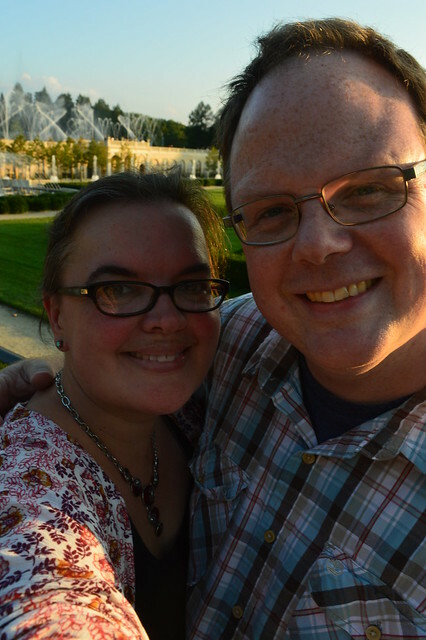 My husband and I decided, therefore, that it was probably safe to plan out a summer vacation. Nothing elaborate, nothing involving crossing an international border, and mostly things that could be cancelled with a full refund at 24 hours notice, just in case. So obviously – because Murphy’s Law – a mere two days after the refund deadline had passed for the one vacation commitment that didn’t have a generous cancellation policy, I logged into my USCIS account and learned that I was being called for interview. Of course, no date or time was provided with the electronic notice. Nope. It was just a notification that I would be receiving a notification by mail. You know what a stress-head I am so you can probably well imagine the panic I had on seeing that notice and the anxiety I experienced waiting for the paper notification. I found I was actually hoping for the same extremely short notice I had received for the Biometrics appointment because then it would be before my vacation. I learned that the notice for an interview is usually between 2 and 4 weeks, parameters that were definitely going to scupper our travel plans. Anxiety was developing into panic and attempts at problem-solving all the possibilities. Could we delay our departure? Could we return home early? Could I fly back to Philly from random road trip location A and get a flight to random road trip location B? After over a week of intense waiting for the letter to arrive, it was good news: my scheduled interview date permitted us to go ahead with our travel plans and I even had a day to spare. Phew. A few days after returning from our road trip, therefore, I entered the USCIS office in Philadelphia for my interview. I went through security and got checked in about 20 minutes before my scheduled interview time but I had no sooner sat down – not even enough time to open my book – when my name was called. The officer who interviewed me was friendly and jolly which immediately put me at ease. After a little bit of introductory admin – such as checking my IDs and Green Card – I was launched straight into the tests. There are 100 possible questions on American civics, history, and geography from which the interviewing officer will ask 10. The first time I took the test of the full 100 questions, I got 96 correct. After studying and really concentrating on dates and numbers (those being my weakness when it comes to memorisation) I was regularly getting 100% but you know how neurotic I am. Those four wrong answers from the first run through niggled at me. I was making anxiety mountains out of molehills. I got 100% on the test. 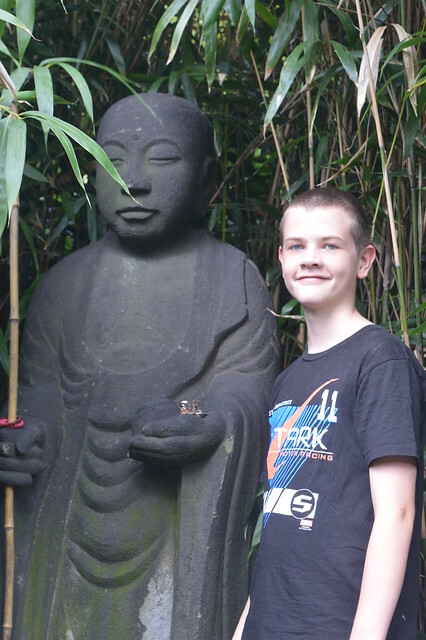 I obviously had zero concerns about the English reading and writing tests and passed those. I was then asked a series of questions that were really just a means of ensuring that my oral answers were consistent with those given on my submitted paperwork. A few more bits of admin and that was it. Interview over. I was approved. The letter had told me to allow for two hours. I was done in 30 minutes. I guess they decided that a marriage of 22 years with 4 kids probably meant this was not some sort of sham Green Card marriage and that no intense interrogation was required. Now there was just one final step. It took about three weeks to receive the date and time of my Naturalization Oath Ceremony in the mail and, when it arrived, it gave me under a week’s notice. USCIS really does like to keep us on our toes. Luckily I don’t work during the summer months and my in-laws had coincidentally flown in two days earlier to they could babysit the children. 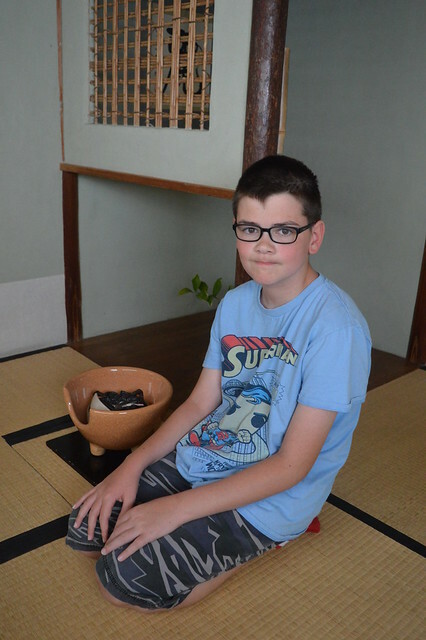 I had swithered about having the boys attend the ceremony but I could not obtain information about provision for guests or how long the ceremony was likely to be so we decided – given the grandparents were around – to leave them at home. My husband had no choice but to take some time off work to accompany me not just because I wanted someone there at the ceremony for me but also because I could not drive myself, having just had general anaesthesia for oral surgery. Yeah, the timing of this ceremony was not particularly great given the state of my mouth and the level of discomfort I was in but I was not about to postpone it. My ceremony was scheduled for 9am on Friday morning. There were 56 other people taking the oath of allegiance with me during the ceremony and we represented 31 different countries. I was the only one from the UK. They kept us all very organised and had us process through various administrative processes according to the rows we were seated in. I was the sixth person into the room and was, therefore, in the front row. The chap who was “compering” the ceremony was very genial and warm and helped put us all at ease. I had this weird, illogical anxiety that something might go wrong at the last moment. A contributing factor was the fact I was still very woozy from the after effects of the anesthesia and strong painkillers which led me to make an error on one of my forms, thankfully not a critical error but one that left me with a malingering feeling of paranoia. I had to return my Green Card as part of the Naturalization admin. It felt weird to be giving away something that has been so important these past few years and something which was quite a bit of an ordeal to acquire. There were some videos to watch and then we all stood for the oath taking part, which was led by another USCIS official. At that point, at approximately 10am, I became an American citizen. I was given my Certificate of Citizenship and all the formalities were over. By 10.30am, I had registered to vote. I will have to change my status with the Social Security department and then I will have to apply for a US passport so I still have some bureaucracy to plough through. However, the big milestone is now done and dusted. I am now Citizen Pict. 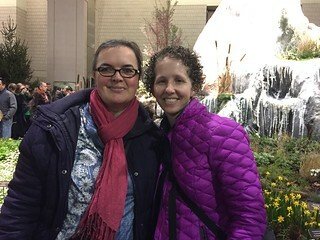 On Saturday, I went with a friend to the Philadelphia Flower Show. On my own. Child-free. No clock-watching or pressure of time. It was an absolute luxury. I really know very little about flowers and gardening. My friend knows a bit more than I do but is no expert. 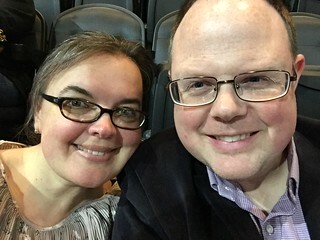 I think it is safe to say, therefore, that attending the Flower Show was an opportunity to just be grown ups together and enjoy each other’s company more than it was about indulging any horticultural interest or ability. This was also my first time attending an event in the Convention Centre. My husband and two of my children have attended Philly Comic Con annually since we emigrated to America so they are veterans of the Convention Centre but I have had no reason to go before. 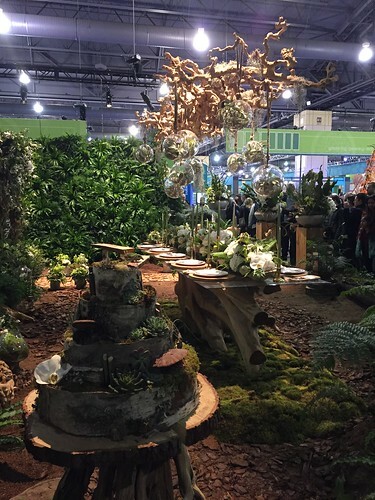 The Flower Show is run by the Philadelphia Horticultural Society and is apparently America’s longest running and oldest flower show, dating as it does from 1829. 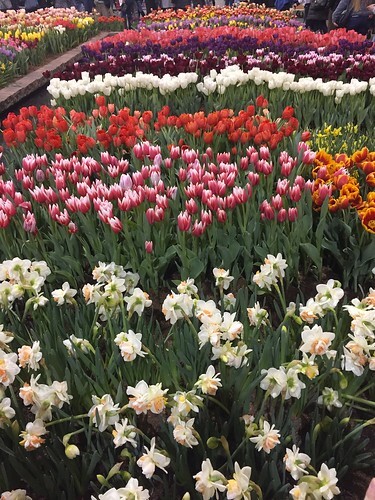 I imagine that people attend in order to be inspired by new plant varieties, by landscape design, to participate in competitions, and to meet with other flower enthusiasts. Aside from the opportunity for a day of unfettered freedom, the appeal for me lay in seeing a riot of colour and vibrant life given how much I have been loathing Winter and craving Spring. Given my degree of ignorance, this will not be a long blog post. I did, however, enjoy wandering among the displays and showcases. 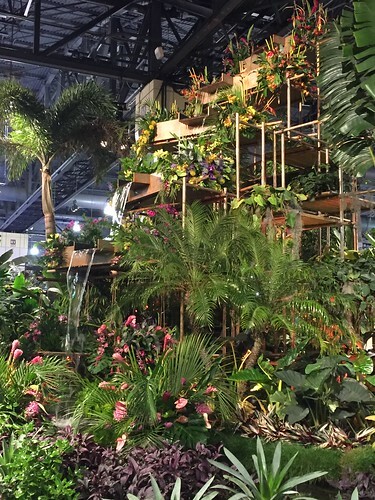 Most impressive was a tropical jungle built around scaffolding poles that had been painted to mimic bamboo and which were festooned with stunning flowers in bold colours, including cascades of orchids and swirling leaves, and incorporating various water features including a series of waterfalls and the occasional shower of rain. 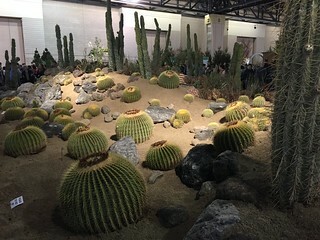 I was also very taken with a desert area filled with an incredible variety of cacti and succulents. My friend and I became a tad obsessed with one colloquially named “dinosaur back” because of all of its folds and ridges. 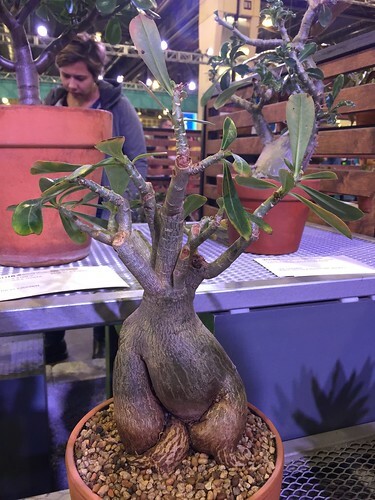 Had one been available for purchase, I might have brought that home with me. 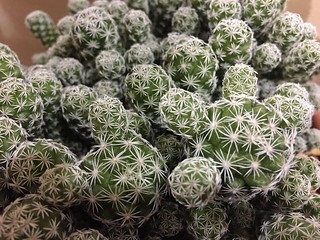 I am not very good at keeping houseplants alive but cacti do somehow manage to survive in my care despite my negligence and evil eye. 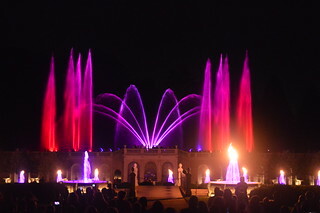 The theme of the flower show was apparently water. That seemed like a very easy challenge to me since almost all plants require water for sustenance and many garden designs incorporate water. Still, I do enjoy a good water feature so I liked seeing the variety of ways in which water had been built into the landscaping. Aside from the water, we noticed some other repetitions of design: glass orbs and copper. We congratulated ourselves on spotting what might be a gardening “trend”. There was. for instance, a visually appealing display involving a mirrored table (imagine keeping that clean of smears and finger smudges?) 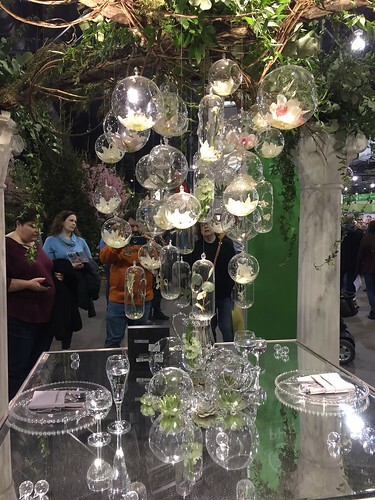 with glass orbs hanging above it like a chandelier, each orb containing a plant. I thought it would make for a pretty wedding table whereas in my home it would make for megatons of stress and fingers being cut on shards of smashed glass. On the subject of weddings, I did love an outdoor wedding table, all wood and soft moss, including what looked like a tiered cake made from slices of log. I could imagine Oberon and Titania dining in just such a setting. The competition areas were befuddling to me. 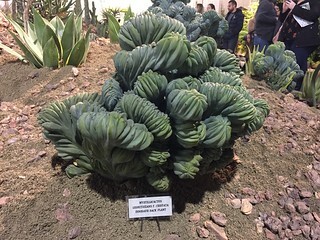 My lack of expertise meant that I could not possibly figure out why one plant or arrangement had been awarded first place while another was an honorable mention. 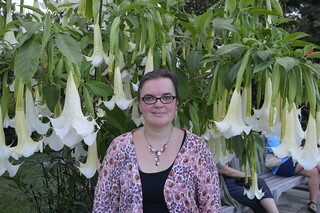 It was another opportunity to see a diverse selection of plants I had never encountered before. There was a miniature citrus tree with blossoms and fruit, venus fly traps and pitcher plants inside humid terrariums, arrangements inside tea cups (I liked those a lot! 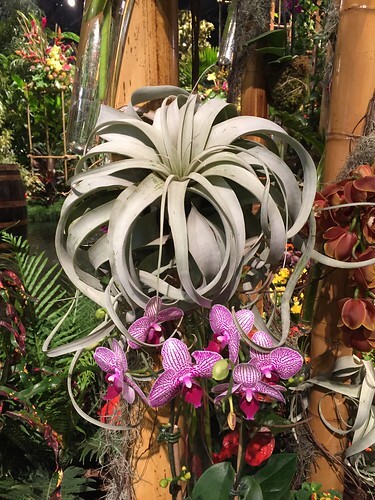 ), lots of breathtaking orchids, and blooms in every shape and colour. 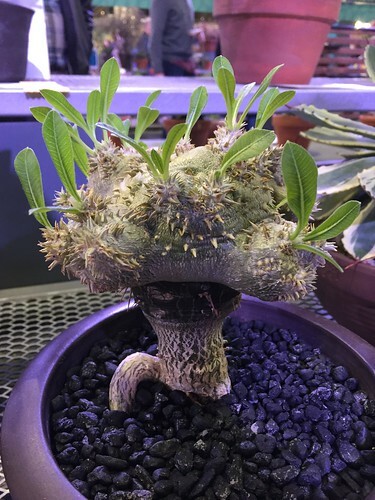 I was drawn to the weirdo plants, the non-conformists, and the ones that looked like me if I was a plant. I got more excited than a grown woman ought to when I spotted some chubby tuberous plants that looked just like mandrakes from ‘Harry Potter’. 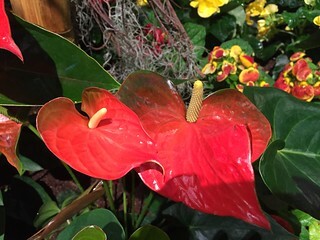 In truth, I cannot say I learned much after a day at the Flower Show and any sense of inspiration was tempered by the reality of my green-finger skills (which are brown-thumbed to be honest). I did, however, very much enjoy a pleasant day out without the responsibility of keeping children engaged. 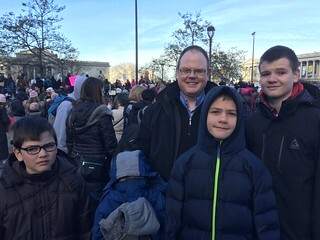 On Saturday, Mr Pict and I took our four sons to participate in the Women’s March event happening in Philadelphia, one of many marches happening across the country and around the world. 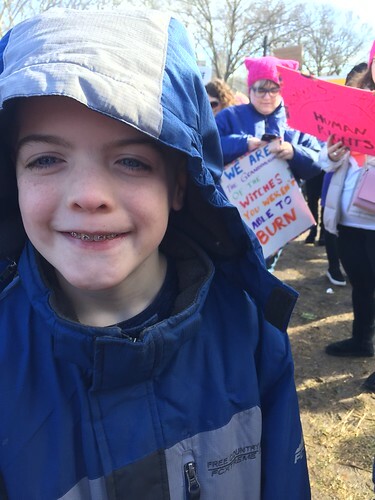 As a result of my Gran’s passion for politics and issues, I started attending protests, marches, and demonstrations when I was tiny, maybe five years old. I have attended scores of such events over the years but then I developed an anxiety problem related to crowds that prevented me from attending any large events, from music festivals to rallies. 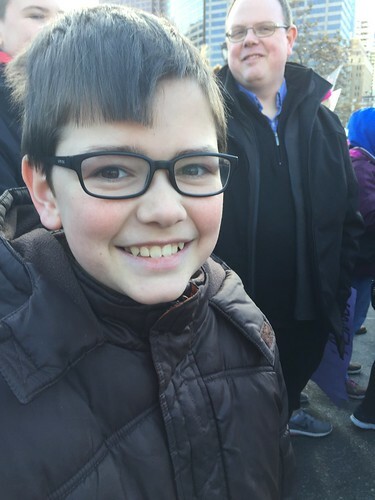 I could not join last year’s Women’s March anyway because I had to work but this year I decided to push myself past my crowd anxiety for a number of reasons: I wanted my sons to have the experience of this form of civic engagement and understand how they can utilise their privilege for the benefit of others; as someone not eligible to vote, it is one of the few opportunities for me to stand up and be counted; and most importantly, I am an advocate for civil and human rights, social justice and equity so I felt compelled to go there and represent not just myself and my family but also be there to support all those who could not attend for reasons of mobility, finance, logistics, or personal safety. The event was superb and very well-organised. The atmosphere was energising and inspiring. 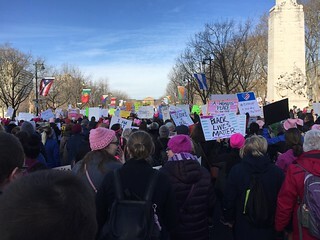 Although there were tens of thousands of people there (I read an estimate of 50,000 people), the route up Benjamin Franklin Parkway was wide enough that I never once felt hemmed in enough for my crowd issue to spark my anxiety. The boys were great and enjoyed reading the placards that so many people were carrying and listening to the chants along the way. Our ten year old is particularly engaged in current affairs so he especially enjoyed the experience of participating in democracy in this way. 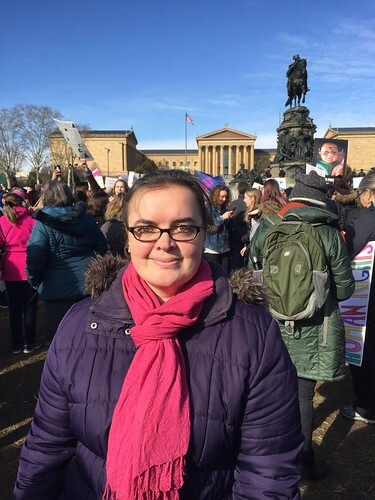 The march ended in front of the Philadelphia Museum of Art and it was there that we listened to various women delivering powerful speeches about the importance of engagement, participation, and activism. It was also thought-provoking and challenging and, given I am a white woman, prompted some self-reflection on what more I can do to channel my privilege for good. I am so glad that we went and added our voices to the throng. 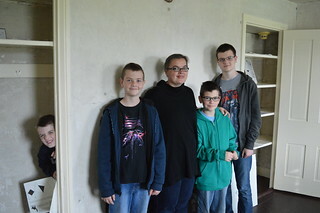 The main focus of my birthday trip to Philadelphia was to visit Edgar Allan Poe’s house in the city. 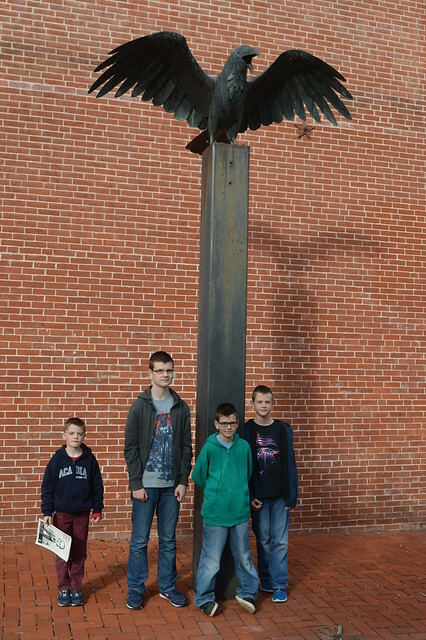 We decided to walk there from the Independence Hall area since it was a lovely Autumn day and it was only about a half hour walk. The only snag was that we had to cross a major road but we did so safely since the traffic was moving slowly. Still, we returned by a different route. When Poe had lived in that property, it had actually been outside the city limits so it was interesting to think how much the city has sprawled since then. 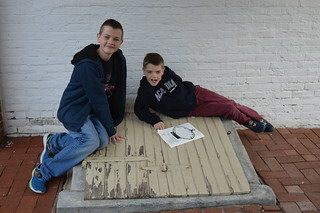 Poe’s house is one of three in which he lived in Philly but the only one still standing. 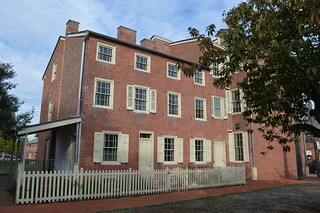 The property has been administered by the National Park Service as a National Historic Site since the 1970s and has been expanded to include two adjacent properties – which I think post-date Poe having lived there – so that one provides space for the museum and one for an additional staircase with fire doors. 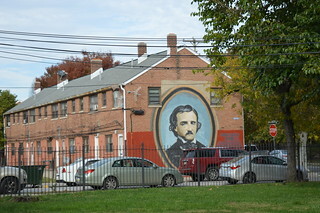 Nevertheless, this Poe house was modest but much bigger than his Baltimore home, which we had visited in August. A Ranger explained that he had been able to afford a year’s rent there after winning a literary prize. 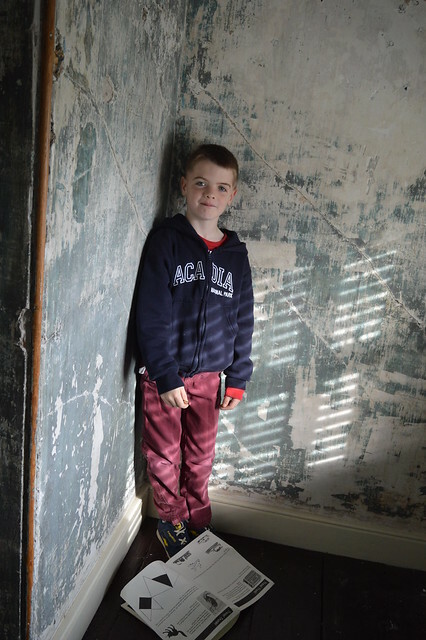 The rooms were much more light and spacious than they had been in the dark and cramped Baltimore home and the staircases, while steep and narrow, were not as claustrophobic as in that property either. 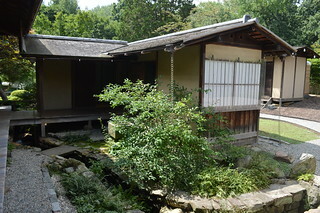 The house is kept in a state of “arrested decay”. The spaces, therefore, give an impression of how Poe, his wife-cousin, and aunt-mother-in-law would have lived but they have not been furnished and there are no personal Poe family possessions on display. 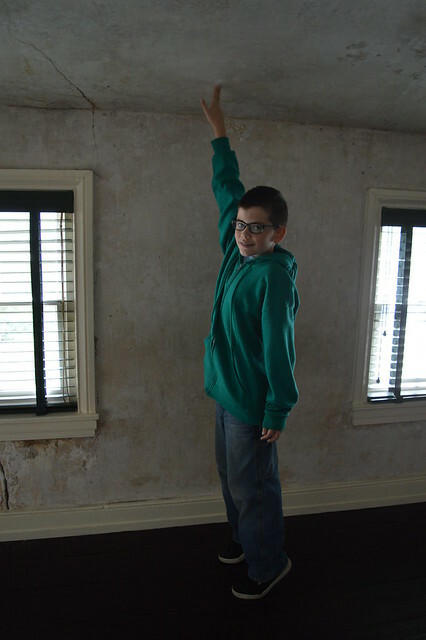 I liked all of the walls covered in layers of peeled paint and the boys loved all of the closets. 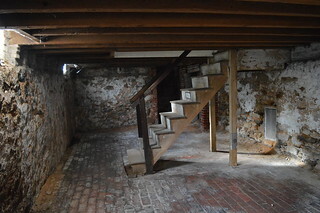 A highlight of the house was the cellar. 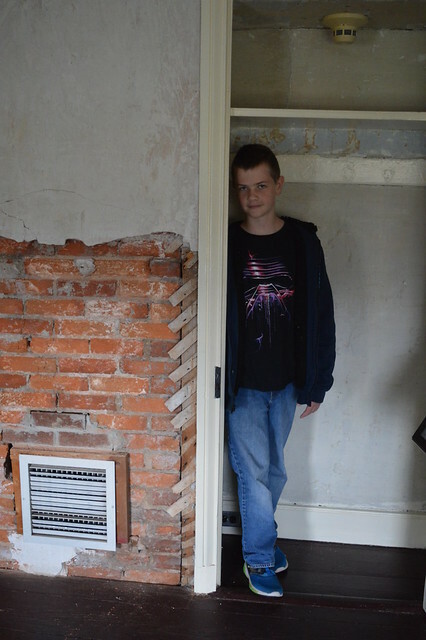 Since Poe is associated with all things eerie and creepy, it was fun to be in a dark and dingy cellar in one of his houses. 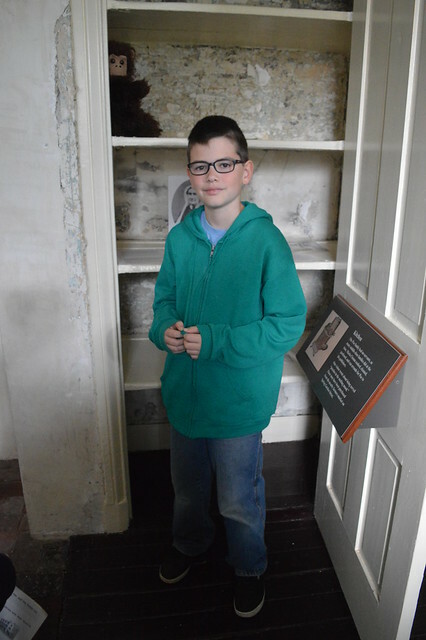 The Ranger had also sparked the boys’ imaginations by asking them where in the cellar they would stash a corpse. Worryingly, they identified several possibilities. Perhaps I should just be glad they are problem-solvers. It is apparently possible that the cellar inspired the one described in ‘The Black Cat’ which appealed to my cat-obsessed 8 year old. 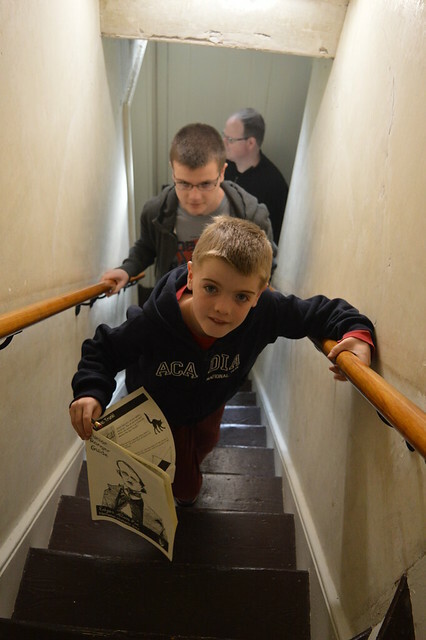 In the museum area of the site, in one of the houses that would have neighboured Poe’s one, there was a room set up as a reading room and a book case full of Poe’s works, books directly inspired by his works, and some volumes of Poe criticism. My youngest son settled at a table and read a picture book. 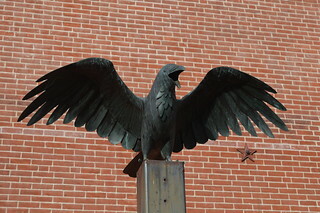 Outside the property, there was a metal raven statue that we all liked and we also spotted a Poe mural on the gable end of a row of houses nearby. So that was Poe’s Philly house and now I only have his cottage in the Bronx left to visit. It is on my travel bucket list. We departed Poe’s house and walked back towards the centre of the city. 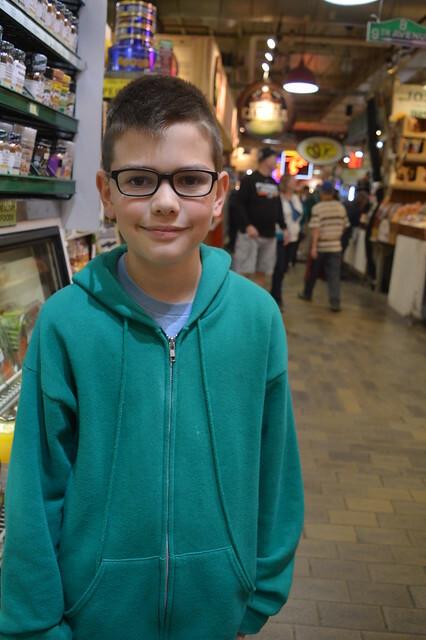 We stopped in at Reading Terminal Market. 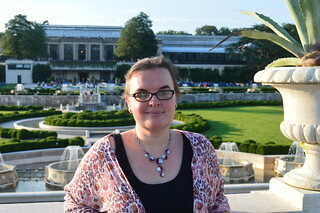 The only other time I have gone in there was also for my birthday trip, back in 2013 just after we had emigrated to America. 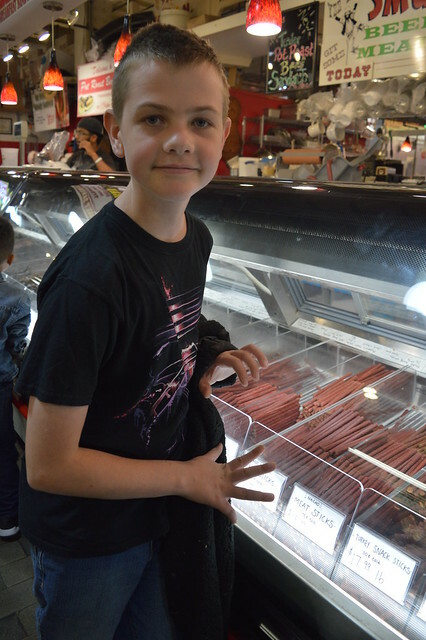 That was a bit of a disaster of a day and we had literally walked into one door of the market and immediately out of another because the kids were fizzing out due to the crowds. It was definitely less crowded on that Saturday evening but the narrow rows between food stalls still made it feel a bit too bustling for me. I really don’t do crowds. My kids are mini foodies so their eyes lit up at the possibility of buying some special treat foods. 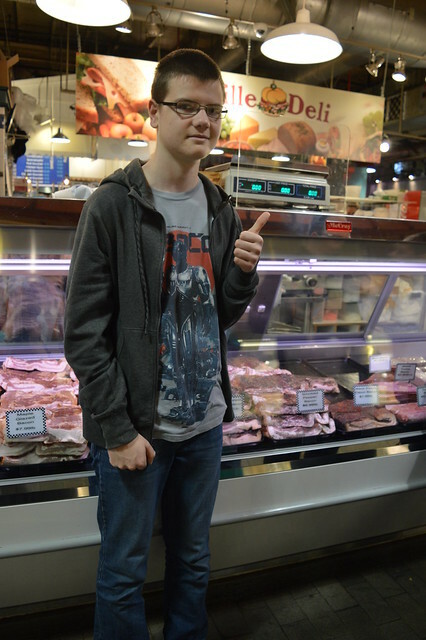 We came away with Cajun bacon, some fancy type of jerky, and some root beer – none of which are things I consume. Then – because we were not done being foodies – we went to a restaurant named Indeblue that serves Indian cuisine. All of we Picts love curries and Indian flavours so we ordered a selection of items from the menu to share as a smorgasbord. It was all perfectly cooked and absolutely delicious and was the perfect way to end my celebratory day.